Thank you for your interest in our party rooms. Hermann Sons Steak House offers your guests superior service and a variety of menu options. We specialize in traditional style service for luncheons, meetings, birthday parties, rehearsal dinners and special occasions. We offer menu plans with either pre-set, person pricing or open menu plans (availability based on number of guests). Our commitment to excellence is what makes Hermann Sons Steak House the perfect choice for your next event. Attached, you will find some additional private party information. I look forward to planning all the details of your event with you. Please feel free to contact Candy Austin with any questions at 830-426-2220. This is a private dining room with accessibility to our outdoor patio and beautiful backyard. This dining room can seat up to 72 guests. This room has twelve 30″ X 48” rectangular tables as well as one small table for two that works well as an appetizer or dessert table. This is a semi-private dining room that can seat up to 30 guests. The six round tables in the room each seat up to 5 guests comfortably. Our beautiful backyard has both a covered patio as well as seating under our majestic oak tree. The covered patio can seat up to 28 guests. The seating under the oak tree accommodates up to 64 guests. The round tables in this area all have umbrellas, but the seven tall bar tables do not. We also have additional picnic tables in the yard area that can seat up to 72 guests. The total number of guests that can be accommodated outdoors is 164. Please note that if your reservation is for our outdoor dining area, we cannot guarantee you space inside if there is inclement weather. Private parties may reserve the entire outdoor area, which can accommodate party tents and additional guests – perfect for weddings, receptions and other special events. We look forward to making your special event a memorable one by providing a beautiful venue, great food, and excellent service. Menu: We have a limited party menu available for parties of 30 or more. The number of entrees offered may be limited so that your food can be prepared in a timely manner and all of your guests can be served in the same time period. For most events, you may select any 3 entrees from our menu to offer to your guests. For parties of 30 or less, we will provide one waiter/waitress to serve you. For parties of 30 to 72, we will provide two waiters/waitresses. For parties of 72 or more, we will provide three or more waiter/waitresses, depending on the final guest count. For all parties over 30 guests, there will be an additional $40 service charge that will go to the wait staff. For outdoor parties we also have an outdoor bar available in which you can choose to have a cash bar or a bar tab which the host will pay. Service Charge & Tax: A 20% gratuity will be added to all food & beverage orders. For groups larger than 30 guests, the above mentioned $40 service charge will apply as well. Our prices are subject to all state & local taxes. Guarantees: A final guarantee of number of guests will be required 48 hours, or two business days, prior to your scheduled event. Any reduction of the event’s figures will not be accepted after the guarantee has been confirmed. If a guarantee has not been received, the original attendance figure will be used as the guarantee. Therefore, we will prepare the number of entrees according to your confirmed guest count and you will be responsible for paying for all of the entrees prepared. If all your guests are not present we will gladly prepare these additional entrees to go. If you have more guests than the number you confirmed, we will do our best to accommodate the additional seating and entrees. Food Service: Hermann Sons Steak House must supply all food. At the manager’s discretion, you may receive approval to bring your own dessert. No alcoholic beverage can leave the premises, with the exception of wine that has been opened and re-corked. We do not have a corkage fee option. Responsibilities: Hermann Sons Steak House does not assume responsibility for damage or loss of items left unattended. Please inform your guests of this policy. Decorations: Guests may provide decorations subject to restaurant approval, arrangements must be made at the time you make your reservation as to the specific time decorating will be done. 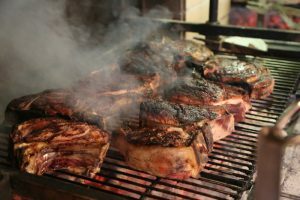 Hermann Sons Steak House is not responsible for loss or damage to any items brought into or left at the property by a guest. Any decorations provided by the facility are the property of Hermann Sons Steak House & may be charged to the guest should they be missing upon completion of the event. Table cloths are available to rent for $5.00 each with advanced notice. Audio Visual Equipment: Hermann Sons Steak House is equipped in the Corbyn Room with WiFi, a TV, and DVD player. The Alvin Room does not have a TV or DVD player, but WiFi is available. A projector and screen for presentations and /or videos can be provided for a $50 fee. Deposits: A deposit will be required at the time of booking of $50 for parties of 20 or more. The deposit will be applied as a credit to your final bill. In case of cancellations, 72 hours (three day) notice is required; if 72 hours notice is not given directly to the Manager On Duty, the deposit becomes non-refundable. Room Rental Requirements: Food & beverage requirements are in place in lieu of a room rental charge. We do not rent out our rooms. Our rooms are for patrons ordering a full meal and are subject to the above mentioned policies and rates. The reservation for a special event is for a total of 2 1/2 hours. This does not include decorating time, but decorating time can be approved on an individual basis. Any time spent in the room over 2 1/2 hours will incur a charge of $50 per hour. This charge will not be prorated. Rates are subject to change & seasonal rates may apply. Engineering: Should your event have additional requirements, such as electric power, lighting or the installation of banners or signs, Hermann Sons Steak House will need to be notified 7 days in advance. Hermann Sons Steak House will not permit the affixing of anything to the walls or ceilings of rooms unless management gives prior approval.